Directed and written by Jacob Rajan. Gobi Krishnan is a middle class Indian man who moves to New Zealand with his wife, Zina, and newborn son, Apu, in search of a better life for his family. He opens up a ‘dairy’—which in NZ is a corner store selling everything from fresh vegetables to mint candies—and is happy chasing his dream in a foreign land. But Zina is constantly homesick and wishes she could go back to the warmth of family and friends in her own land. He tries to comfort her, even as he chides her for not being friendly with the customers. She fusses over him, and cribs about life in a bitterly cold climate. And thus the couple—who has had an arranged marriage—gradually “grow into love”. 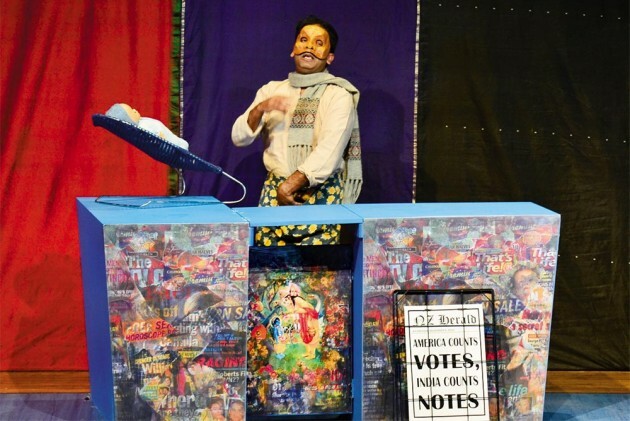 Their delightful tale of love is first narrated to the audience in a ballad-like song sung by Jacob Rajan, who is not just founder of the theatre group performing the play—Indian Ink—but is also the writer and sole actor. He himself plays every single character, both male and female, merely changing face masks to take on a different role. This is all the more amazing, because the performance is packed with dialogues between characters, including heated exchanges. Rajan flicks the masks on and off so swiftly it leaves you with the overwhelming sense of actually having witnessed a conversation or a quarrel. 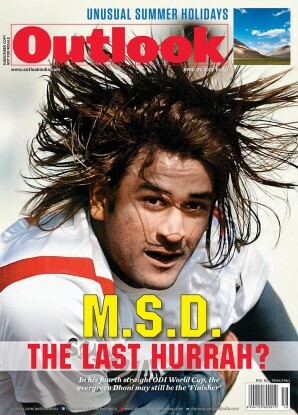 More remarkably, he is able to take on distinct personalities with simple changes in mannerisms—the pronounced slouch of Gobi or gender-specific body movements, like the slightly ‘feminine’ hand movements of Zina—without reducing it to a caricature or stereotype. Cha­nging expressions, visible through the eye-openings of the mask, play a definite role in creating the illusion of a dazzling array of characters. These include Mughal emperor Shah Jahan and his beloved wife Mumtaz Mahal, who are brought to life—before being laid to rest, at least in the case of the latter—in a subplot that merges with the love story of Gobi and Zina. The historical narrative, too, is enchantingly retold by Rajan, who brings out lesser known, yet more scintillating aspects, of the famous Mughals, such as the long original names of the emperor and his queen as well as details of the cruelty and tyranny that was unleashed on the people by the grieving emperor while the Taj Mahal was being created. The masks for Shah Jahan and Mumtaz Mahal are as fascinating as they are cleverly conceived, with the two sides of the same headgear representing king or queen (with the result that when Rajan as Shah Jahan turns his back, he becomes Mumtaz Mahal). Infused with generous doses of humour, Krishnan’s Dairy, however, is at its core a heart-wrenchingly realistic narrative that brings to the fore life’s pathos and helplessness. Justin Lewis and Adam Ogle deserve special mention for mask creation and sound effects respectively. Ogle’s sound-synchronisation (with Rajan’s mime) is unfailingly perfect...down to the last tinkle of the cash register, the click of closing drawers, the squeak of opening doors and the swish of plastic bags when vegetables are dropped into it. Other magical Ogle-Rajan harmony happens when the former accompanies the latter on guitar for the singing of ballad-like songs. 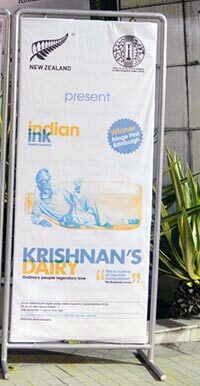 Indian Ink’s plays, especially Krishnan’s Dairy, the first of a trilogy, which was first per­­formed in NZ in 1997, have won international acclaim and a host of awards, including Production of the Year (three times), Best Play (twice), Best Actor (four times), Best Com­p­oser (twice) and two Fringe Firsts from Edi­ngurgh. Brought to India for the first time in a joint collaboration between the cultural ministries of the governments of India and New Zealand, Krishnan’s Dairy, after being staged in Calcutta and Bangalore, will travel to New Delhi.